The Rubber Cafe' -New Release Blog Hop - Final Day! Welcome to The Rubber Cafe new release blog hop! This is Day #5 our last and final day in our new release celebration!! 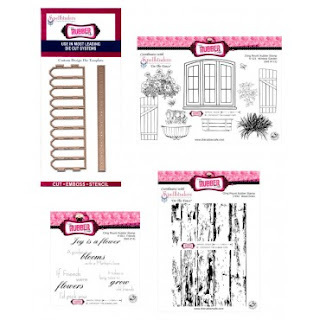 If you’ve just joined in the fun, we are celebrating our new release called On the Fence bundle, which also happens to be our Grand Prize, so be sure to read on through the end of the post to see how you can be eligible for this fantastic set! 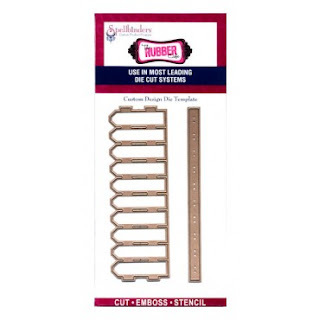 As you can see this set comes with a new exclusive The Rubber Café die template manufactured by Spellbinders Paper Arts called On the Fence! And you'll find the creative options are endless! Your first stop today is with one of our Designers, Kristine Reynolds. 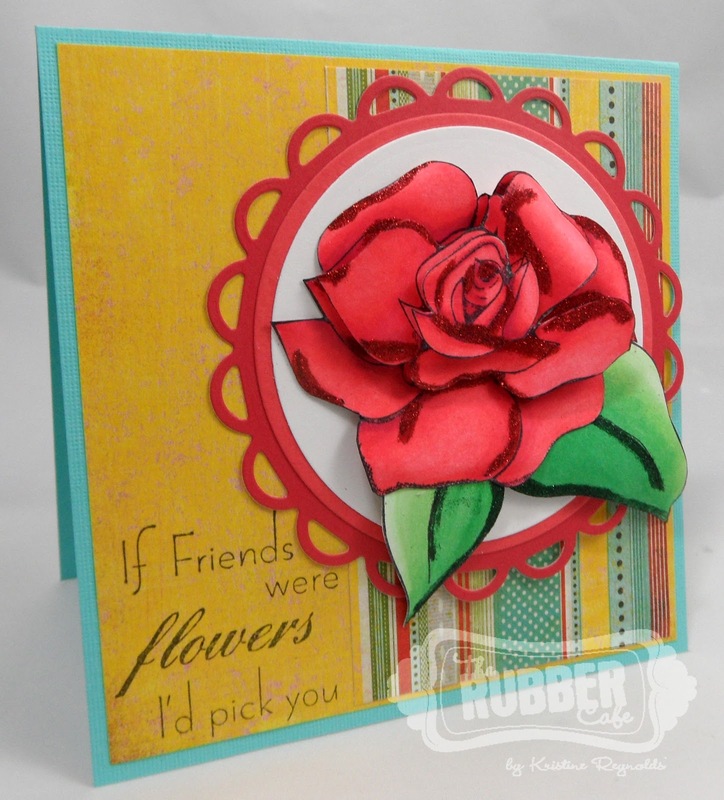 Kristine’s card is a beautiful example of Kristines’ abilities and talents as a Designer. 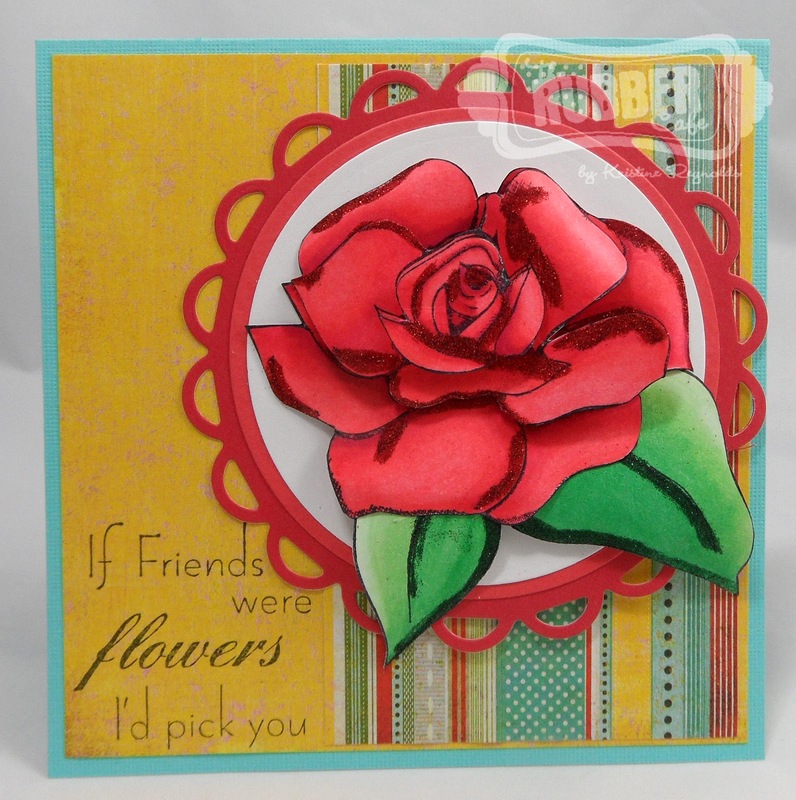 Along with our On The Fence die, Kristine is showcasing some another newcomers to our line, the Wild Rose, and Friends Stamp Set. 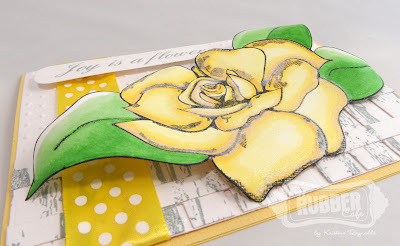 Stamped and colored in warm buttery yellow. You're definitely going to want to get a closer look, so hop on over to her blog HERE. Our second stop today is with one of our newest members to our Team, Jen Matott! Jen is a true Mixed Media artist, and we’re so lucky to have her join our family! I’ve been looking forward to seeing what she would come up for our New Release Hop. I was not disappointed and I promise you won’t be either! Here's a sneak peek into what she's been working on. Remember if you've just joined in the fun - there's still time to go back and check out each day from this past week, and leave a comment here as well as on each Designers blogs, and become eligible for the Grand Prize available! Follow us on FaceBook and you increase your chances. One lucky winner will win our New Release Bundle below valued at $69.99!! The Rubber Cafe - New Release Blog Hop-Day #4! Welcome to The Rubber Cafe new release blog hop Day #4 in celebration of our brand new releases!! 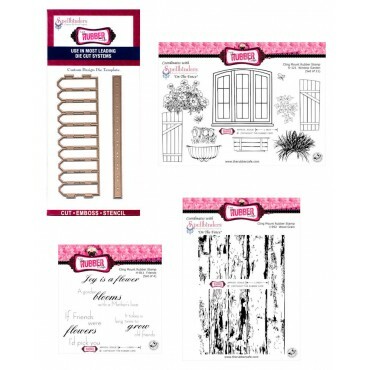 We are celebrating our new release called On the Fence bundle, which also happens to be our Grand Prize, so be sure to read on through the end of the post to see how you can be eligible for this fantastic set! As you can see this set comes with a new exclusive The Rubber Café die template manufactured by Spellbinders Paper Arts called On the Fence! And you'll find the creative options are endless! Here's the rest of my wall hanging - the fun part of this project was in using the new On the Fence die! It's versatility amazed me! Each time I've teamed it with the Window Garden set, but I tried to use it differently for each portion of my wall hanging. The middle 'Sweet' Shoppe, I used the die to cut my striped awning paired with theWindow Garden set this was fun! I also added a corner of fence on the lower edge cut again from corrugated cardboard. The last 'Home' section I think may be my favorite! Here I used the Fence die as a fence, but my special twist, I wove my black gingham ribbon through for a finishing touch. Here's a close up of my roses. I also have more information and pics on the rest of my wall hanging. 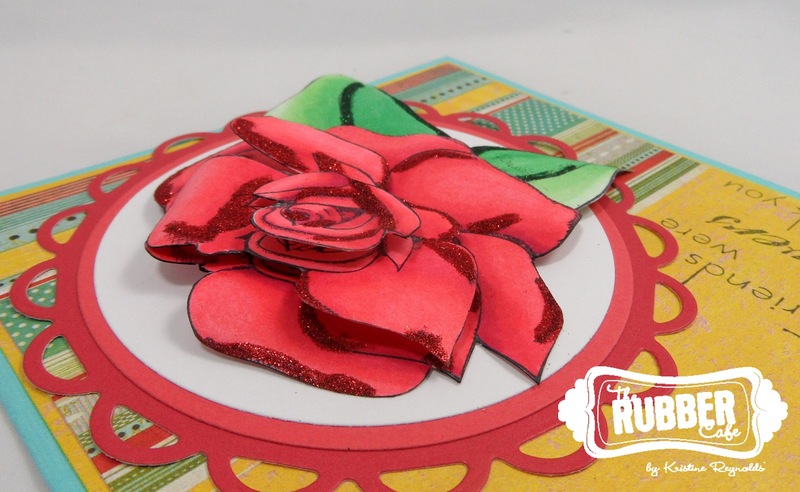 This bundle comes with a brand new exclusive die template manufactured by Spellbinders Paper Arts called On the Fence Die! 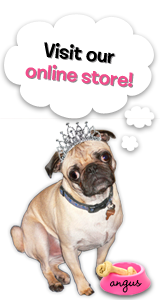 Welcome to The Rubber Cafe new release blog hop Day #2 in celebration of our brand new releases!! You’re first stop today is with our Glue-ista Heidi Blankenship. 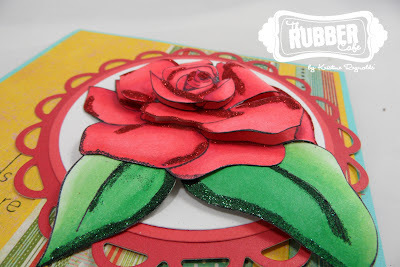 She has a great tutorial on how to make this beautiful rosette out of book pages. 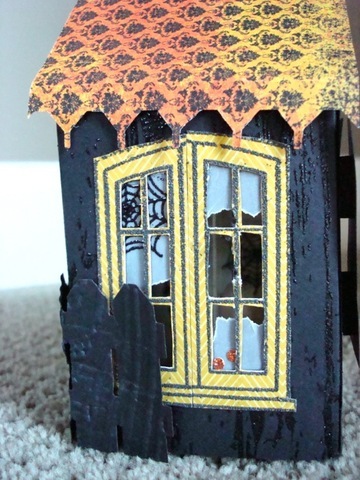 You won’t want to miss out on all the beautiful details and work she has put into this stunning project. 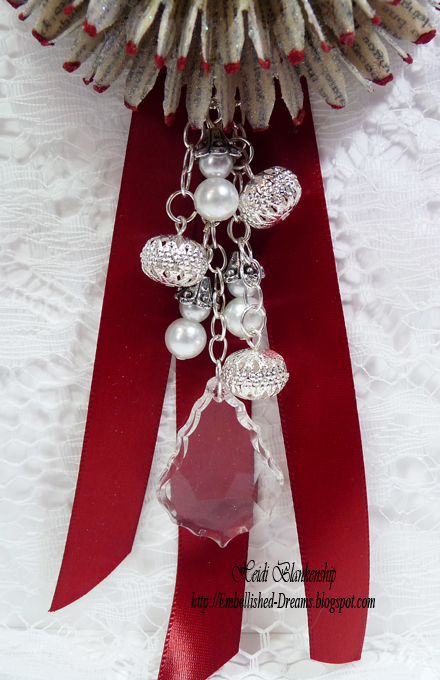 From the jewels to the ribbon and of course to the You’re So Fine Glitter, this project has it all. To get the full step-by-step tutorial head over to her blog HERE. You next place to hop is with our new Design Team Member Debbie! Debbie wow’ed us with her mad project skills as a Guest Designer so much that we decided to officially ask her to join our family. Debbie did not disappoint with this adorable basket. 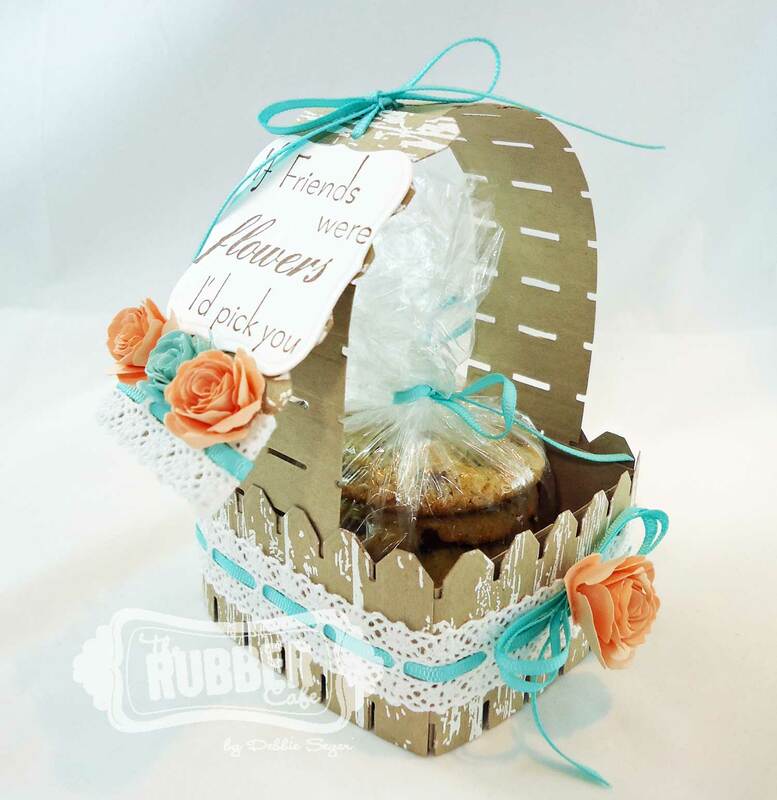 Debbie used the Wood Grain stamp, and embossed the stamp using Jasmine Mix'd Media ink and white embossing powder onto kraft cardstock and then cut/embossed using the On the Fence Die template to make this cute basket. Debbie also added a tag using the Friends stamp set. Inside she tucked some yummy cookies for her special friend! 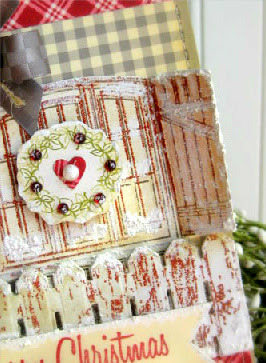 You can see a tutorial on how to make this basket using the On The Fence die on her blog – HERE. As you continue on the hop, don’t forget the great Grand Prize available! One lucky winner will win our New Release Bundle below valued at $67.99!! 1. Leave a comment on our blog and each designers blog throughout the hop. Yes that’s it. Easy right? If you want to earn an extra entry, simply follow our blog and/or our Facebook page and then tell us you did that by commenting below. Just be sure to come back here each day to find out who the participating designers are and then “hop” to each blog and leave a comment. If you have any questions, please ask. Our team will be watching the comments and will answer them right away. New Release Blog Hop : Day #1!! Welcome to The Rubber Cafe new release blog hop. This is Day #1 in celebration of our brand new releases!! We are very excited you’re here with us!! Before we begin the hop, we also wanted to give a special shout out to all of our Facebook Fans!! We are inching our way towards 5,000 likes and we wanted to thank all of you for being such great customers, fans, and followers! SO THANK YOU for making this year such a great one!! Before we get to the wonderful inspiration we have for you . .
What would a blog hop be without a great Grand Prize??? Not very fun huh? We’ve made this new release extra special by creating a fabulous Grand Prize! One lucky winner will win our New Release Bundle below valued at $67.99!! Let’s get started with the HOP! We are celebrating our brand new release called On the Fence! This set comes with a new exclusive The Rubber Café die template manufactured by Spellbinders Paper Arts called On the Fence Die! 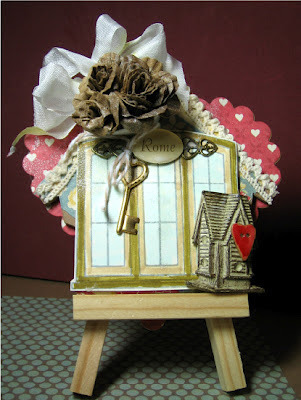 Here’s a peek at what Tesa will be showcasing: a beautiful step-card. She used the On The Fence die, Small Trailing Butterflies, Window Garden, and Friends set to create this stunning window garden scene! For more details and to leave comments, please hop to her blog. 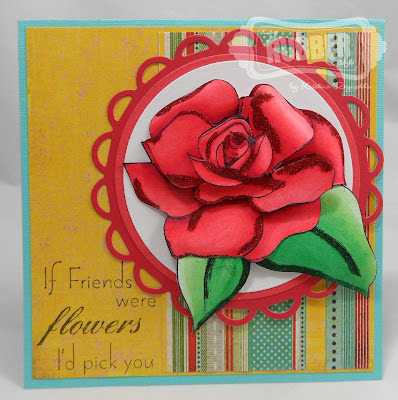 You’re second stop today will be with Michele who is showing us how to make beautiful flowers and embellishments using the On The Fence die and our Friends set. 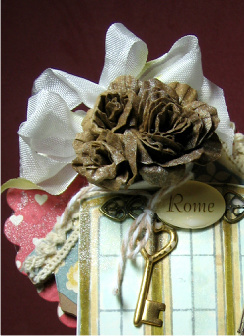 These vellum flowers are simple to make using our Scrap Happy Sheer glue and a few vintage buttons. For more details and to leave comments, please visit her blog. Don’t forget to follow us on the blog hop each day from August 27-31st to find out what all this die can do! Also leave comments on all the stops along the way to be eligible for the grand prize too! It's another weekend! I don't know about you - but this week just sailed by! 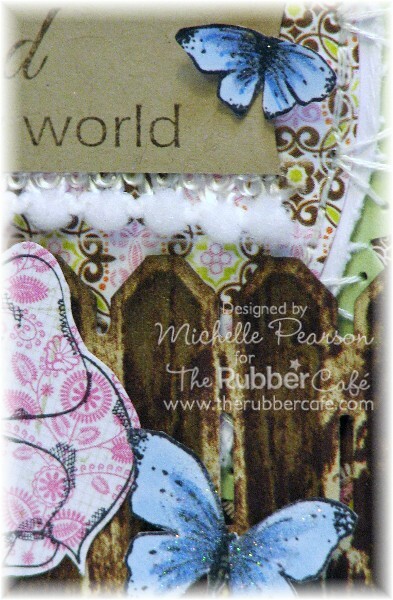 Well we're busy here at The Rubber Cafe', getting ready for our New Release Blog Hop planned for next week, so check back in here tomorrow for our Sneak Peek intro and the rest of the week as The Design Team and The Rubber Cafe' Glueistas' share their cards and projects we hope will inspire you. 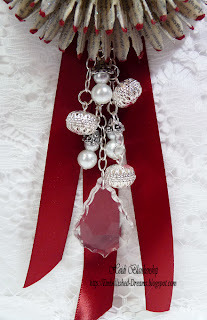 So today I'm here to send out a 'teaser' - my project today is a portion of my blog hop post. Featuring the Window Garden set and On the Fence Die. 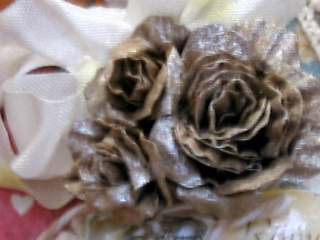 I love my corrugated paper roses, and will share more about those next week. I will say I used some Shimmer frosted white spray on the corrugated roses, and I just love the shimmer that they now have. Tools: Spellbinder's On the Fence Die.